If you read enough about investing in index funds, sooner or later you will come across DFA funds. Authors who are also investment advisors mention DFA funds in their books and articles. DFA funds are said to be better in that they capture the small cap and value factors better. Their small cap funds invest in smaller companies. Their value funds score higher on the value scale. The catch is that you can’t buy DFA funds without a DFA-approved financial advisor. Those who don’t want to pay an advisor to join the club wonder whether they are missing out on something when they are shut out. There is a backdoor. A small one. You don’t need a $1 million. Nor do you have to pay $1,000 a year or more to an advisor. Some employers have DFA funds in their 401k-type plans. If you happen to work for one, you can buy DFA funds there. I’m not talking about those. This backdoor is easier to get in. Many people are already in. For the purpose of this article I’m not getting into the debate about whether you should want DFA funds to begin with. DFA vs Vanguard is a bit like iPhone vs Android. People who have DFA say they are great. People who don’t have it say they can get by without. I’m only showing you how to get into DFA funds inexpensively if you want them. West Virginia Smart529 Select Plan offer investment options exclusively in DFA funds. It’s a 529 plan. You don’t have to be a West Virginia resident to use it. It has age-based options and 10 static portfolios at different risk levels. You don’t get to pick individual funds. One of the ready-made portfolios should be good enough though. The program manager charges 0.42% on top of DFA’s fund expense ratios. West Virginia charges another 0.05%. Considering that other 529 plans also have some extra cost — for example Vanguard 500 Index Fund costs 0.21% in Vanguard’s Nevada 529 Plan versus 0.05% outside — you are really just paying extra 0.3% if you move your current 529 plan to the West Virginia plan for DFA funds. If you are investing $100k, the extra “toll” costs $300 a year. That’s much lower than what an advisor with access to DFA funds would charge at that asset level. These funds are institutional class funds with lower expense ratios. For instance the net expense ratio of DFA Global Equity Portfolio (DGEIX) is 0.31%. The ones marked with an asterisk are each limited to maximum 25% of the account. The good part about the Utah’s 529 plan is that it doesn’t charge an extra toll for investing in DFA funds. You pay 0.2% administrative fee on top of DFA’s fund expense ratios, but you would pay the same extra 0.2% anyway if you invest in other funds in the plan. There’s no added cost for investing in DFA funds. Many already consider Utah’s 529 plan as the best 529 plan before it added DFA funds. If you don’t have or need a 529 plan, it’s probably not worth creating one just for investing in DFA funds. If you already have one, and if you want DFA funds, it may be worth shuffling between your 529 plan and your other accounts: move your 529 plan to Utah for DFA funds and put other investments in your other accounts. Note it won’t work if your state recaptures past deductions if you move your 529 plan out of state. Some 22 states don’t offer a deduction to begin with or they don’t care which plan you use. Another 12 states offer a deduction but they don’t take it back if you move the money out. Only a minority of states offer an incentive for 529 plans and they require you to both contribute to and stay in the in-state plan in order to get the incentive. I beg to differ: this definition you quoted only applies to the smaller in number of *two* groups constituting a whole. It may not even make sense for greater number of group in the whole. What is minority, for example, if groups are 40%, 30% and 30% each? One would probably have to say that there is majority group of 40% but no minority group. But if one must designate minority in the case when there are more than 2 groups in the whole, minority nomination would only make sense in respect of the smallest group, if there is one. Just ask anyone you know what is minority group among 50, 16, and 12 and see how many people would answer anything but 12 (my guess is zero). Of course, I am just having fun here, not trying to undermine your main point. I guess I have a little bit of sscritic in me 🙂 (note to others: if you are not bogglehead, you will not get this joke). If there are three groups, 40%, 30%, 30%, none makes up a majority alone. They are all a minority group. This is seen in a minority government. Even when the largest minority group leads, it’s still a minority. When the white race falls under 50% in the population it’s said to become a minority. Harry is correct. The 40% group is a plurality. That’s good to know, Harry. I’ve got a Utah 529 that I started nearly ten years ago. 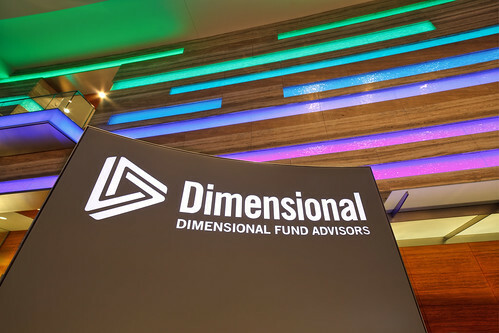 I was unaware of their Dimensional Fund offerings and I hadn’t thought of that choice. I first chose the Utah 529 plan when it was mentioned in reviews, long ago, as offering one of the lowest fees out there at that time, even for non-residents. Utah residents get an even better deal for fees. Of course the reviews that I mention were long long ago, and there might be better 529 plans out there nowadays — I haven’t checked. Utah’s plan is still one of four gold-rated plans according to Morningstar. Today I changed my Utah 529 (UESP) allocation to the Dimensional Funds. The only way I found to do this was to choose to make your own “customized static” portfolio, which you assemble yourself from a choice of funds offered mostly by Vanguard and Dimensional. Something to watch for is that UESP limits your allocation in a “customized static” portfolio to a maximum of 25% per fund. That means that you cannot put all your funds into just one or two Dimensional funds. For example, you cannot put all your funds into the DFA International Value Portfolio (DFIVX). You have to spread it out. Because UESP offers only a sampling of DFA’s funds, you can’t get all that much concentration into something like small cap domestic stocks, or international stocks, by using DFA funds only. In my UESP portfolio, I had to include a two Vanguard international funds along with DFIVX to achieve a 75% international allocation, which is what I sought because of domestic stocks that I have elsewhere. The 25% maximum per fund is only on select funds marked with an asterisk, not across the board. You can put 100% in DFA Global Equity Portfolio (DGEIX) if you want. The examples I gave in the article still work. PJ, the technology is a proprietary institutional technology that is integrated with TD Ameritrade. The Vanguard portfolios have no transaction costs and make sense for any account size. We decided to offer DFA portfolios designed for qualified accounts for 0.25% with a transaction fee of $24 to invest in the entire portfolio with no transaction fees for rebalancing. While there is no stated account minimum, this makes sense with $5,000+ lump sum investments. These are no-compromises, DFA institutional portfolios comprised of 12,000+ securities. The DFA portfolios for tax harvesting are designed for non-qualified, high-income situations and include a $24 fee per trade for each position. They are cost effective at the $25,000+ level but make the most sense at $250k+. Each individual stock portfolio is comprised of 20 stocks, and each stock has a $9.99 transaction fee. These portfolios are cost effective in the $50k+ but $100k+ is probably a better starting point to get the most out of the tax harvesting. They are not adequately diversified to be considered core equity holdings so should be used as a complimentary component of a primarily passive portfolio. The benefit is that they are volatile, so an investor could maximize their tax harvesting potential with a much smaller slice of their portfolio than with ETFs or funds, significantly reducing risk and turnover. We could offer no transaction fee DFA portfolios but we would have to bake the transaction costs into large account minimums and higher fees. As far as I know this is easily the least expensive way to purchase real DFA funds anywhere at any account level. Everything is subject to change and I am open to your suggestions. I am committed to making this platform the most transparent, best value anywhere. You can also get some DFA clones in variable annuities. With VA wrapper fees as low as 0.10% (TIAA-CREF) it’s a reasonable alternative. Not so much for taxable accounts (since index-ish funds tend to be tax-efficient, so you’d be converting long term gains into ordinary income). But if you’re looking at these funds for an IRA, a VA is another approach (in spite of the rule of thumb not to put an annuity inside a tax-sheltered vehicle). I am a DFA approved advisor and I built an online Vanguard, DFA and individual stock solution that may be of interest. The platform fee is 0.1% and I am considering charging 0.15% for the Vanguard models (17% lower cost than direct from Vanguard) and 0.5% for the DFA and individual securities portfolios. The Vanguard model is intended for small accounts. The higher cost for the DFA and the individual securities models reflects the emphasis on tax harvesting for non qualified accounts. I may roll out a lower cost DFA version for IRAs if the demand is there. There is really no point in owning the individual securities in an IRA. As my assets under management grow the expenses will automatically decline for all investors. I highly recommend the UESP. I set these up for my clients for free. UESP even pays the entire expense ratio on the Public Treasurers Investment Fund. I believe it is the best 529 plan in the nation. There is a good reason DFA only allows people to invest through advisors: it keeps out the day traders and skittish investors. While this benefit may not be reflected on the expense ratio, this reduces drags on net performance that is subsidized by disciplined, long term investors: small accounts, trading costs, selling during market weakness, cash and taxes. A small DFA customer, the advisor, has tens of millions of dollars to invest and is far more disciplined than the average retail investor. My job is to rebalance, harvest taxes and keep out the short term investors. Everyone wins. Watch out for annuity subaccounts such as TIAA Cref etc. The fees can be exponentially higher than their mutual fund equivalent. My technology is in place. I am just waiting for approval from the regulators. In the meantime, I would appreciate your feedback on pricing and what types of portfolios are missing in the marketplace. At worst, the VAs cost a handful of basis points more; one even costs a microscopic amount less. If by “subaccount … fees” you actually meant account fees, TIAA-CREF’s wrap fees are no more than 0.50%, declining to 0.10% depending on size of annuity and how long you’ve had the annuity. Please don’t lump TIAA-CREF (or Vanguard) in with high cost, loaded annuities from demutualized insurance companies. Annuities typically have rules in place to keep out the day traders you’re worried about. In the case of TIAA-CREF’s VA, there are both explicit rules with 60/90 day restrictions, and discretionary rules – orders may be rejected if they are viewed as disruptive. I am also a TIAA Cref authorized advisor and with few million dollars invested with TIAA Cref. It is a fine company but you are kidding yourself if you think they are not out to make money like all other financial institutions. I was simply pointing out that the net DFA expenses vary significantly from annuity to annuity, regardless of how they are distributed. Some own the underlying funds at an additional cost, and some replicate the funds on their own and miss out on a number of DFA benefits related to execution. No matter how they shuffle the costs, all variable annuities, including TIAA Cref, essentially become your DFA approved advisor for an additional (and less competitive) expense. To your point: For the vast majority of investors with less than $100,000 invested in the DFA Global Moderate sub account with TIAA Cref for less than 10 years, the current charges are 0.9%. The comparable DFA mutual fund is the Global Allocation 60/40 portfolio with an expense ratio of 0.29%. You would have to pay an advisor 0.61% to equal that expense, and in non qualified accounts the tax consequences can easily dwarf any cost differences: you would lose the step up in basis, you would not be able to deduct any of the fees and you would convert long term capital gains into ordinary income. Yikes. This is the annuity cost shuffle. Jefferson National, Vanguard and Lincoln all do the same thing with their no-load annuities and have more or less competitive access to Vanguard/DFA depending on very specific circumstances. None of them are a cheaper way to get around a DFA advisor who is just managing the investment. Have you considered that a DFA approved advisor may add real, quantifiable value and is not just there to take your money? Why are you so willing to pay more to Vanguard and TIAA Cref who then charges even more, hires layers of managers, marketing personnel and staff for a call center and pays them a salary to upsell their agenda instead of the entire fee going to pay a real professional for advice? Your local RIA can cut out those layers of expense, many conflicts of interest and can also do it with far, far more transparency. Your local RIA is where you are most likely to find the least conflicted advice from the most qualified people at the lowest cost. Roy, what online platform are you using for your portfolios that only charges 0.1%? Does that also include trading? Thanks! The California Scholar share program is an option for those who want DFA access as well. Program fees are lower than any other program I know that offers DFA. It’s not as customizable as Utah, but you can choose just DFA for international equity or global portfolio which has DFA funds in it among others, and set portfolio percentages as you like between these two. You can mix and match DFA with PIMCO or index equity or bond funds in whichever way you like. That is a decent plan, but I wouldn’t say the California Scholar share program is a viable DFA option. The Active International Equity portfolio has a traditional profitability tilt and is heavy large cap instead of the value/small cap tilt that differentiates DFA. This may keep the cost (0.45%) fairly low, but it does so by excluding more expensive asset classes and, therefore, increases opportunity cost. The Active Diversified Equity Portfolio is only 30% DFA and with a 0.58% expense ratio, almost double a DFA portfolio cost (not even counting turnover costs), fair but hardly a bargain. Fair point, Ron, I agree in that 529 plans with profitability tilts probably do not exist, except those with DFA funds. For small cap value purists, you won’t get exactly what you are looking for in the Utah plan either: The DFA international developed is large cap value (not small cap value), and there is no DFA EM fund: you have to choose vanguard. I would have been ok with this personally, but the added administrative expense ratio was 0.2% on top of plan fees higher for customization. PJ, sorry for the delayed response. I believe my firm offers the lowest-cost way to access DFA through http://www.everspiresma.com. The fee is 0.25% plus transaction costs: $0 for ETFs, $10 for DFA funds, and $7 for individual securities. ETFs are substituted for DFA funds for small transactions to minimize cost. Individual securities are used to compliment DFA funds to enhance tax-loss harvesting opportunities. No: Minimums, proprietary products, markups, soft-dollar arrangements, or revenue sharing. I’d appreciate ideas of how we can improve. Good luck to all of you.